Producer Edward Small returns with another swashbuckler based on a story by Alexandre Dumas, as he was on an annual basis at this point (though the run was about to be interrupted by World War II). Louis Hayward, Small’s usual star, was slated for the lead, but he took a part in a prestige drama instead, so the dual rôle of the Corsican twins instead went to Douglas Fairbanks, Jr., who delivered one of his best performances. But in the end it all works out, with Doctor Paoli’s help—because science! 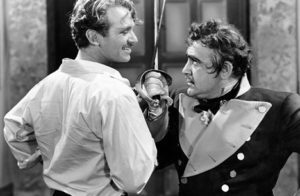 The final sword fight between Franchi and Colonna was Doug Fairbanks, Jr.’s favorite of his entire career.